Udry writes: “Members of the Senate Judiciary Committee believe that Trump’s nominee for FBI Director, Christopher Wray, did not pledge his loyalty to Donald Trump, and will not sweep the Russia investigation under the rug. And apparently very little else matters to them. “The Committee unanimously approved Wray’s confirmation [Thursday], clearing the way for full Senate confirmation before the August recess. “Unlike members of the committee, we were not satisfied with Wray’s testimony at his confirmation hearing, and his response to additional Questions For the Record (QFRs) posed by Democratic members of the Judiciary Committee do little to allay those concerns. “As is often the case in these confirmation hearings, members of the Senate are forgiving of forgetfulness and inability to recall important incidents and conversations, as well as general ignorance on issues that are vital to the job the nominee is applying for. 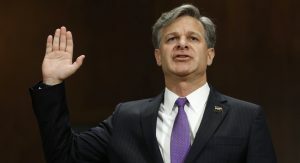 “Wray told Senators that he doesn’t know what the FBI is up to with regard to terrorist recruitment, isn’t familiar with how hate crime statistics or police use-of-force incidents are reported, doesn’t know much about the FBI’s budget, can’t comment on a host of matters including voter fraud, anti-Muslim campaign rhetoric, and unabashedly admitted that he hasn’t even reviewed the Attorney General Guidelines for FBI Domestic Operations (the rulebook that governs FBI investigations) recently.